Santa rides a Thoroughbred Racehorse! 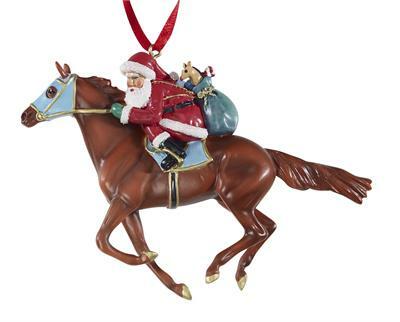 Santa trades in his reindeer in favor of a new form of transportation in this fun ornament! Santa is in the irons of a beautiful chestnut Thoroughbred racehorse, and he’s speeding down the home stretch of Christmas Eve! With his bag of gifts slung over his shoulder and a determined gleam in his eye, this piece will be sure to bring a smile to anyone’s home!